Stanley Banagura Jr. addresses journalists about repealing the criminal libel law. The question was a fair one. 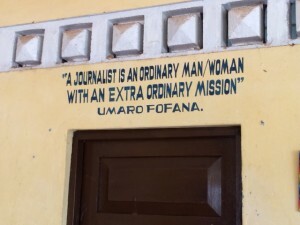 “What do you see as the future for journalism in Sierra Leone, maybe in the next five years?” radio journalist Matthew Kanu asked as I mopped the sweat from my brow for the umpteenth time that oppressively hot day. I gave a positive answer to the thousands of people listening in on the five Radio Maria Catholic stations carrying my live interview. The real question is what will Matthew and other journalists make of their opportunities in this time? It doesn’t matter what I think, if I’m right or wrong. All that matters is what people here, journalists up front, work to accomplish in a country desperately seeking solutions to many obstacles holding back a free press and free speech. For starters, imagine a law that can not only hold a journalist criminally responsible for an allegedly libelous statement but also hold citizens to those expectations for simply reading or listening to those words. A paper calls the president a rat. The reporter is jailed for libeling him, detained 10 days. You think, too bad for the journalist. That same law applies to any citizen who writes or speaks ill of another. And, if you are one of the many people who are seen reading that rat reference, then you could be arrested and charged with sedition, extending the defamation into the public sphere. Kelvin Lewis stood next to me on a particularly hot topical day as I tried to catch a breeze on the porch of the Sierra Leone Association of Journalists’ office. I paused with my answer for a moment, letting the question carry its full weight into my conscience. I had no positive reply. There has to be a starting point if things hope to get better for the media in Sierra Leone. Some would say that the press is well on its way past a starting point, that it has gained momentum and respect in its battle for press rights. But don’t tell that to Kelvin, who manages one of the nation’s papers and is revered here as a stalwart for the press. At times it’s hard for him not to feel defeated. The U.S. Embassy, which brought me here this week for a series of talks with dozens of journalists, wants the SLAJ to make some headway toward solidifying its position as a primary carrier for the free-press banner. That makes sense. After all, who better to fight for free press than the press itself? But after six hours in a sun-baked oven of a room with SLAJ members, it was hard to be positive. Every plausible idea designed to make progress seems hopelessly doomed for one overpowering reason: The government of this nation doesn’t want the press to have real rights. Not like the ones we enjoy in the U.S. Not even close. When you can jail a journalist for referring to the president as a rat and face criminal libel charges, you are at a threshold that defies anything attributable to a democracy. 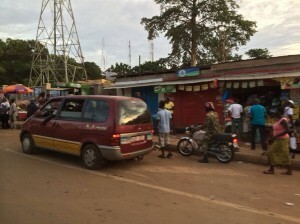 Street scene in Freetown, Sierra Leone. In Sierra Leone, calling the country’s president a rat could find you being interviewed by police and court officials as you face criminal libel charges. By interview I mean detained and interrogated by police. By libel I mean criminal charges, as in jail time and fines as opposed to American civil libel laws that require the element of malice toward public officials. As difficult as it is to read this, it’s tougher to write after sitting among journalists and government officials today as they recount their versions of this case. 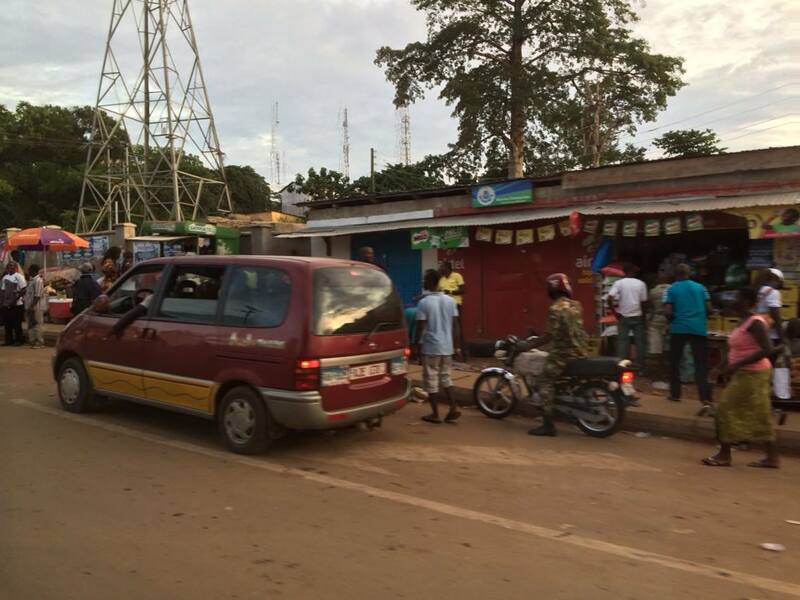 After one day in this West African nation, it’s premature of me to pass judgment on more than a decade of antagonism between the press and the government, but one thing is surfacing – both sides need intervention. If calling the president a rat is the worst of journalism here, it would be easy to side with the journalists as they hold their elected officials duly accountable. Sadly, the rat comment seems mild compared to other stories I’ve heard and some evidence I’ve seen. Sitting alone with my thoughts in Chicago’s O’Hare International Airport, I find myself anticipating the next leg of a journey that will find me in Brussels, Belgium, come morning light. By day’s end Sunday, I should be laying my head on a pillow in Freetown, Sierra Leone, ending one journey, but really starting another. Come Tuesday I will have been with the Kiplinger Program in Public Affairs Journalism at The Ohio State University for one year. When I interviewed for this position and talked about ways we might enrich the training of journalists — where we might go and what we’d do to make that happen — it’s safe to say neither director Doug Haddix nor I envisioned me being in Africa on my one-year anniversary. But sometimes opportunities come to you. This trip on behalf of the U.S. Department of State is one such opportunity. Oddly, it fell into my lap last month while I was in New England for another Kiplinger speaking engagement. I remember sitting in a small café shop in Brattleboro, Vt., reading the email. 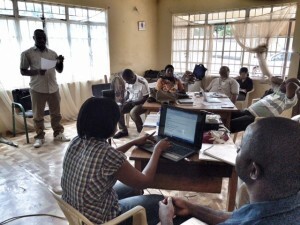 Would you consider coming to Sierra Leone and working with the embassy to help improve the journalism climate? Who can resist an offer like that? Since I accepted I’ve been cautioned by several friends and family about keeping my wits about me there, advice too numerous and obvious to share here. Duly noted. But, as I peer over reports from the State Department and the United Nations, both of which have people routinely working in Sierra Leone on behalf of a free press, I find myself more concerned over the state of affairs for journalism than I do my own health. To be blunt, it’s a mess.